I have wanted to make a simple camisole top for a while. 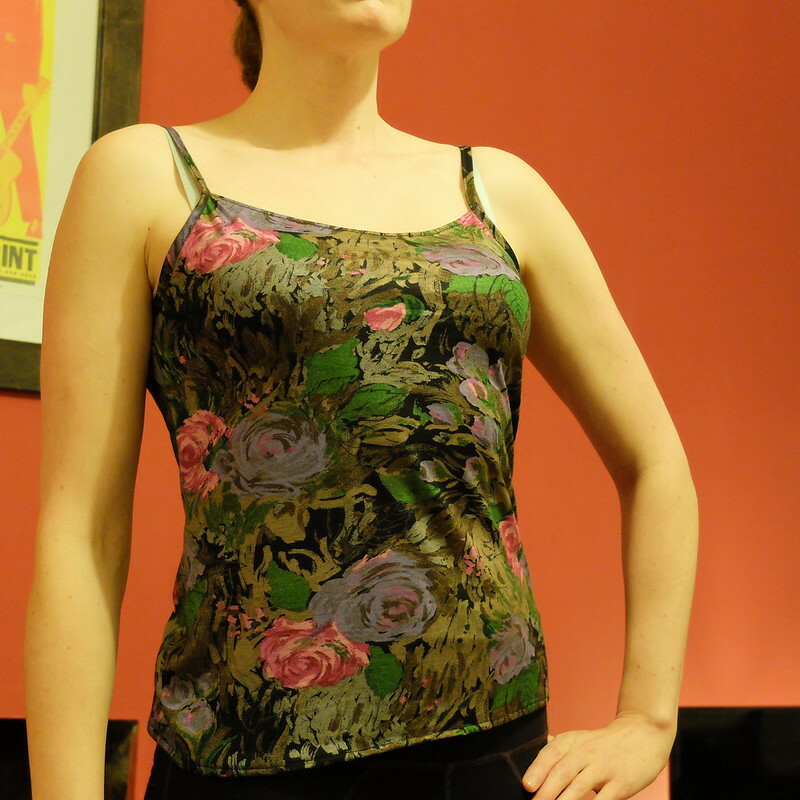 I had some pretty floral jersey in my stash that was in two very small pieces, so a cami top was probably the largest item I could make with it. This pattern is from 1997. I can't quite believe that the 1990s are considered vintage now, but the pattern is indeed 20 years old. Look how pleased the cover model is with her camisole! I think she looks like she should be in an episode of 'Friends'. 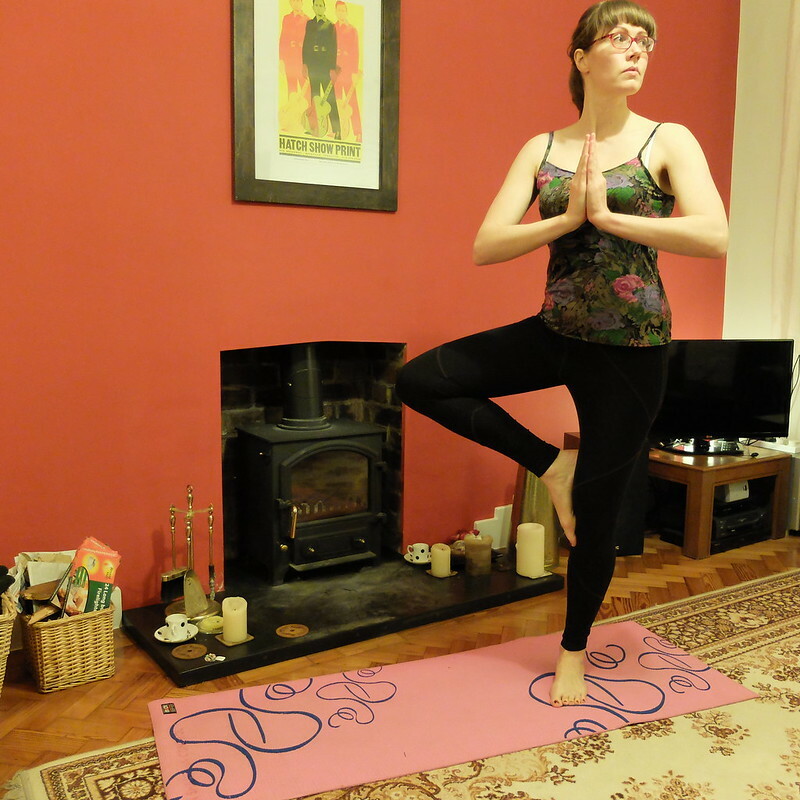 Because I was using a stretch jersey instead of the non-stretch fabric recommended on the back of the packet, I made quite a few changes. Firstly, I followed this tutorial to remove the bust dart, as the jersey camisole tops I already own don't have them. Next, I removed the back seam. Originally the pattern had a slit at the top, fastening with a button. A bit fussy, and not practical to have a button at the back when I was intending the camisole to be for sleep wear or yoga wear (buttons digging in are no good!). 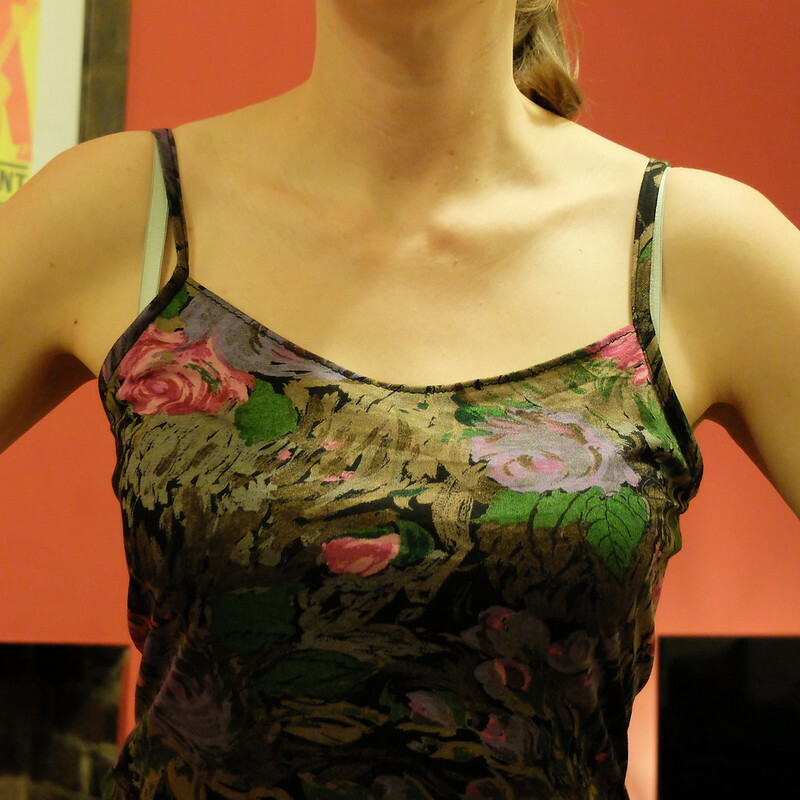 Finally, I had a go at scaling up the bust to fit me, as the multi-size pattern was cut to a smaller size. I mistakenly thought that because the pattern was '90s, that the sizing would be closer to modern day, but the '12' it states on the packet is actually more like a modern size 8. My changes didn't all work out. The back and front pieces didn't line up in the underarm area so I had to slice a piece off each side. Then the top was mysteriously far too big, so I took a good inch off each side. The straps were too long, so I shortened them. As in past projects, I found the armhole binding tricky. 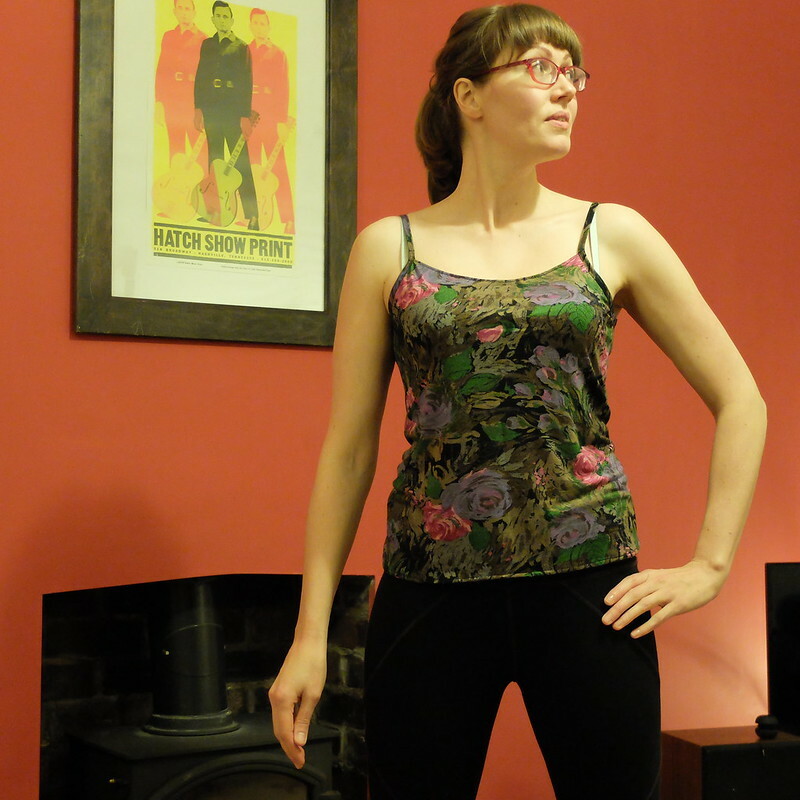 It seems miraculous now that this top came together into something wearable at all! But wearable it is. Though I wasn't aware of the ripples of fabric at the back until I took these photos. Apparently my husband was fully aware of them in the fitting process, but he thought they were a 'feature' so didn't tell me about them! Total cost: The gorgeous fabric was only 25p from a charity shop, the thread was free (in a box of sewing items given to me), and the pattern was 25p. Total cost of materials, 50p! I wouldn't use my altered pattern again due to the litany of errors. This is not my finest work, but I certainly had 50p's worth of fun putting this together. 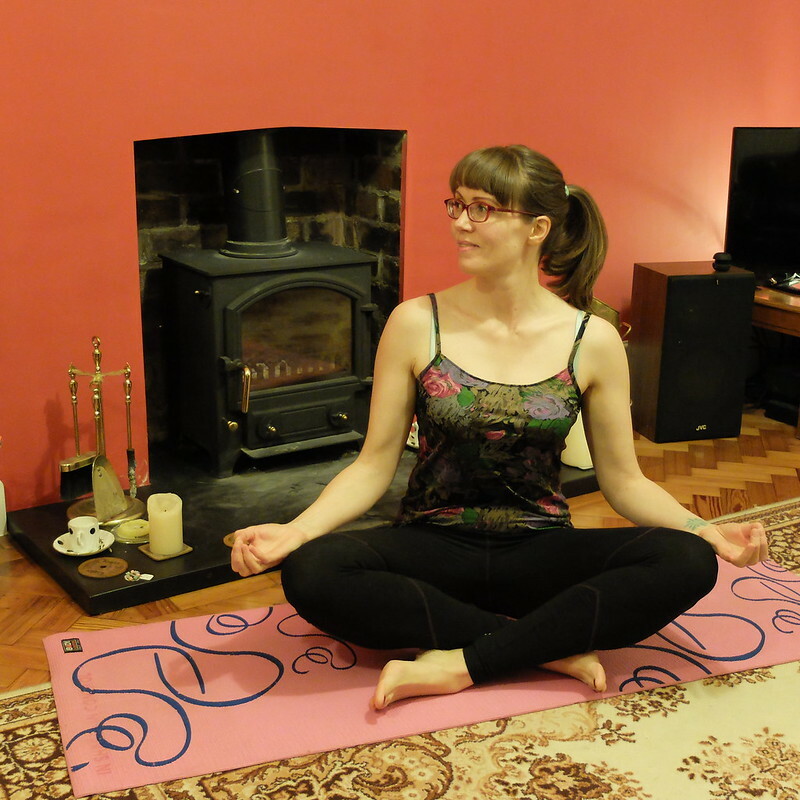 It was nice to have a quick project after the seemingly endless Clemence skirt. I would perhaps go back to the original pattern and try again to resize it, without the other amendments. Onwards and upwards! Next on my sewing table is another skirt from the Tilly and the Buttons book, and a rather fabulous '70s dress pattern. I like it. The ripples at the back look more like a design feature than a mistake. And it is very pretty fabric. I struggle to find decent slips at all in modern shops (even M&S), you've given me an idea there to try and make some! I have some nice vintage ones but nylon does create static. I thought the ripples at the back were a design feature too! I like them. Oh for a calf length slip!! I have been making a 20s dress that's a bit sheer and haven't found a slip yet to wear underneath so I can photograph it for my blog. I'll probably have to make one!! modern camisoles are stretchy in wide and length - but if one has a bigger bust and short back like me then they slightly ripple too. bust darts connect the longer front length with the usually shorter back length. Thanks for the thoughts Beate, I didn't really think of how the back would be affected by removing the bust darts. It's a steep learning curve!! I liked the top and the cost is great! I think that the top really looks great and I thought that the back was supposed to look that way, too :) Yes, it's incredible that things from the 90's are seen as vintage now! Cute top, very pretty fabric. 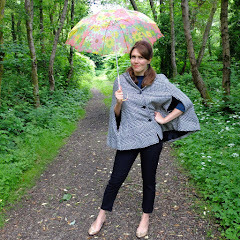 Regarding it being mysteriously too big - some patterns include a lot of design ease. If the measurements aren't printed on the pattern, you can measure the width yourself. If you find the pattern's got say, 4 inches of ease included at the bust, when you'd prefer to have about 2 inches, you'll know you need to scale down from the start. Also, you generally won't need as much ease for a knit top as a woven. The annoying thing Dee is that I measured the pattern - before and after adjusting it - so it should have been spot on. I messed up somewhere!! What a pretty top! 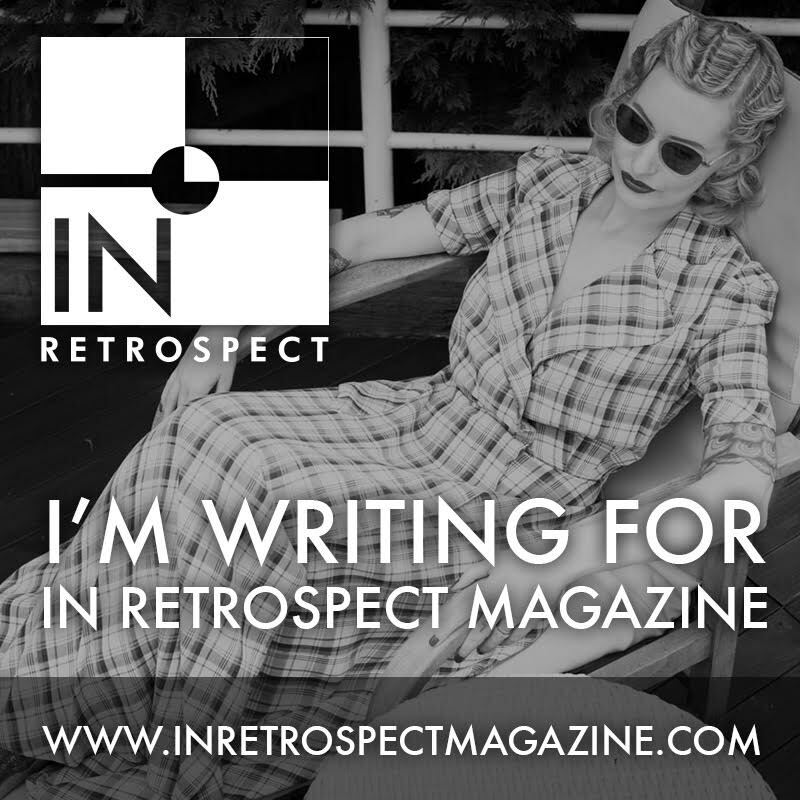 I was also shocked recently to see the 90s labeled as "vintage" - please, I'm just getting over the 80s being vintage! Re: the sizing - sizes changed in the mid/late-80s (I refer to this as the Great Size Shift), where all women's sizes dropped two numbers. So, a 10 became a 6. I shop a lot of second-hand/vintage/thrift, and this helps me identify the year on some clothes. Your pattern may have been a riff on an earlier design, with new packaging for '97 - I don't sew, but I've read that sewing sizes still adhere to the old sizes. BTW, the old quote from Marilyn Monroe saying, "I'm a perfect size 10" means she was actually a modern size 6, NOT a modern size 10. 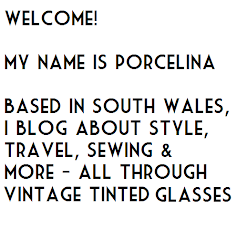 Thank you for commenting on my blog, Porcelina! I appreciate it! Thanks for your suggestion that it might have been an older pattern re-released with new packaging, that might explain the old sizing. Being a vintage collector mysrlf I'm used to the old sizing but just wasn't expecting it on something from 97! I've seen some of Marilyn"s costumes. Tiny. Such a cute little top! I'm baffled as to why the back is draping, but it looks so pretty that it doesn't matter at all. I'm feeling the need to make a load of lounge wear type garments recently: so camis, slips, bed jackets etc.. so this type of little top is perfect! Very cute! While the ripples would probably bunch up under a cardigan, as a standalone piece the way you're wearing it they look intentional. Despite the issues making it, this is totally wearable with leggings or jeans. You made such a good go at it! I love seeing these sewing projects you've been doing. I can totally see why your husband thought that the back was a feature! It does look like it was intentional!